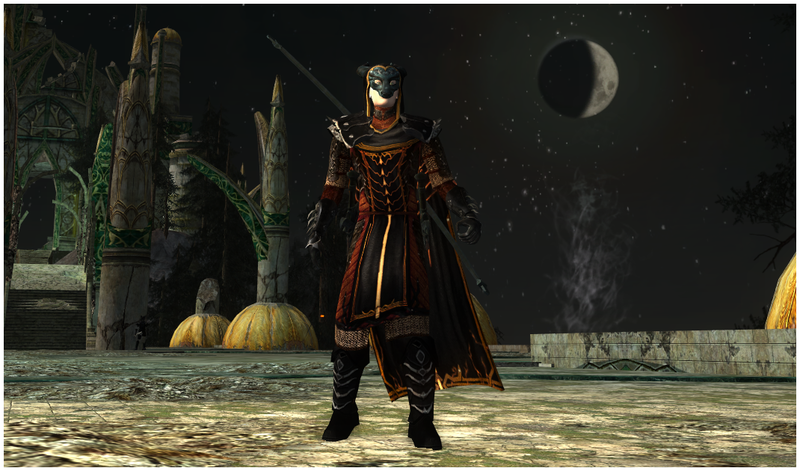 You may have guessed it, based upon the title, that this outfit was inspired by Thrang, one of the major bosses from the Rift of Nûrz Ghâshu. That particular fight was isolated from the level 50 raid, made scalable, and was introduced as a temporary stand-alone instance for the duration of the Summer Festival this year. From the rewards, either by lucky drop or by spending ten vault tokens, you could collect your own two-handed Thrang's Sword, which features a tip that glows red-hot as if it were pulled from a forge. Whenever you land a blow with it, it sparks wildly, casting embers into the air. 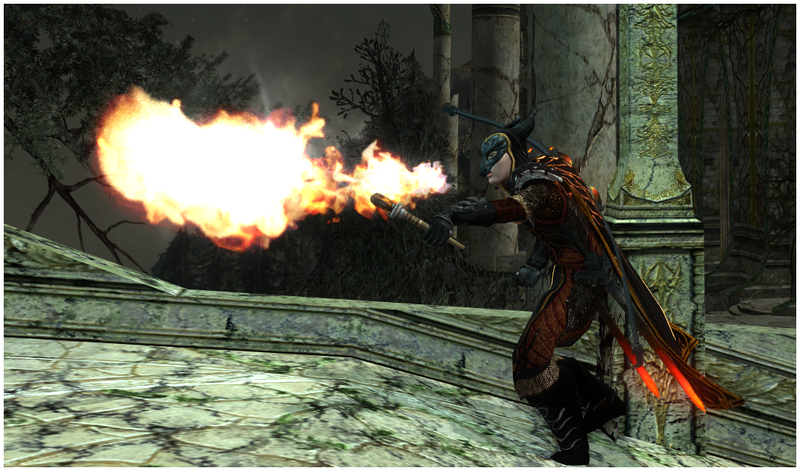 Also, the sword leaves behind a small stream of embers so long as it's visibly equipped. 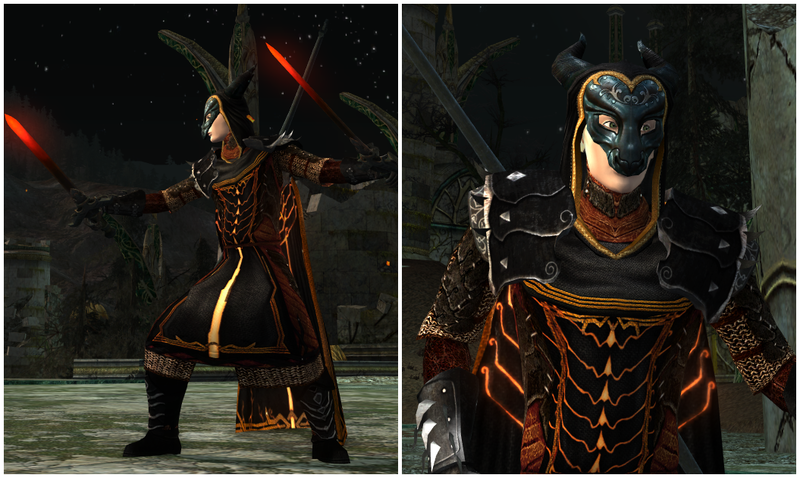 Although this outfit doesn't feature the two-handed sword, it does showcase the one-handed version and Thrang's Bow, which can be acquired from the Armory of Thrang box at any time. This box is found, rarely, in Gorgoroth Lootboxes or at the Keeper of Mysteries vendor in Mordor for 900 Ashes of Enchantment. Eleven other selectable weapons can also be found in that box. Once again, I've gone a created a weapon-centric outfit. With the Thrang's equipment being two-toned, I figured that'd be a good place to start. Two matching cosmetics came to mind immediately, the Flame-touched Hauberk and the Flames of the Deep cloak from the skirmish camp. 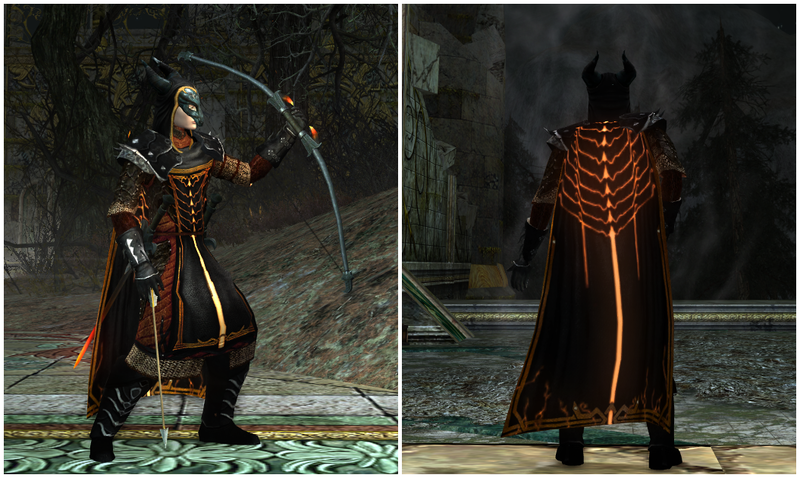 Although two of the oldest pieces in the game, which are hardly used anymore, the cloak is known for it's fiery glow and the hauberk for matching it, albeit glow-less. Dyeing them black emphasizes the flaming oranges and yellows, which made it easier to compliment the weapons. The boots, gauntlets, and shoulders from the Keeper of Mysteries were added for their spikes, for a more threatening and dangerous appearance. The mask was an unusual choice for me. I've always preferred circlets or no head wear, as I like to see my character's face and hair unobscured. This time, I wanted add a little mystery to the aforementioned danger, not to mention the ability to easily blend into the shadows. There's also an alternative to the mask. The Reforged Rift-seeker's Circlet from the Summer Festival (bartered with one vault token) is a suitable replacement with it's black band and red jewel. Harvestmath came early this year, that's for sure. At least on this blog anyway!